No one wants to hang out with Jimmy Fallon. “The Tonight Show” host proved once more that he is incompatible with pretty much every guest the NBC late-night staple books to the couch. Last night, Fallon played “Best Friends Challenge” with pop star Demi Lovato. It again resulted in zero matches. Watch the video above. And perhaps it’s time to join a Meetup group, Jim. "The Handmaid's Tale" won big at the 2017 Emmy Awards on Sunday, while "Stranger Things" was not so lucky. The outcome of the Outstanding Supporting Actress in a Drama category dropped some jaws this year, given the fierce competition. 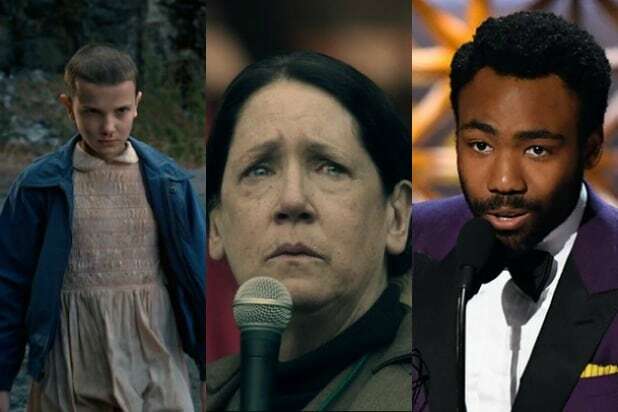 Ann Dowd, also nominated in 2017 for her guest-actress role in "The Leftovers," was seen as a surprise pick over such prominent names as Chrissy Metz, Thandie Newton and Millie Bobby Brown. The Netflix hit came into the Emmys with 18 nominations and was seen as a possible contender for top drama series. But while it prevailed in five below-the-line categories, it was snubbed in all the major categories. Surprise: "Black Mirror: San Junipero"
There's no question that "Black Mirror" is having a moment, but it was certainly up against tough competition for Outstanding Television Movie, notably star-filled "The Wizard of Lies" and last year's winner, "Sherlock." This was one of two prizes in the night for "Black Mirror." Snub: "Feud: Bette and Joan"
The FX project's 18 nominations led the way for all limited series this year, but while it took home two trophies at last weekend's Creative Arts ceremony, the Ryan Murphy-created show lost all 10 of the categories it was up for on Sunday. Donald Glover topped two-time winner Jeffrey Tambor ("Transparent") for his first Emmy, which takes the sting off "Atlanta" missing out on upsetting "Veep" for best comedy. The HBO series led the way with 22 nominations but lost in all of its categories on Sunday, making do with five Creative Arts wins. Outstanding Drama Series was likely the most-debated category heading into the ceremony, without any clear frontrunner. But the fact that "The Handmaid's Maid" topped such popular shows as "Stranger Things" and "This Is Us" made for quite a memorable win.